Yuri Kuliy at Tverskoy District Court, Moscow. Source: OVD-Info. This week, Yuri Kuliy, one of four defendants in the investigation into the 26 March anti-corruption protests, was sentenced to eight months in prison. This is the first sentence in the criminal case opened after the demonstrations, which saw protests in cities across Russia. Kuliy, who participated in the Moscow protest, was accused of violent conduct towards a police officer. Kuliy has told his solicitor, however, that in the episode in question he was merely trying to separate an elderly man and a police officer. The aggrieved party, a riot police officer, claims that Kuliy grab him by the arm, thus causing “physical pain”. Read our report from the trial and the story of a man detained together with Kuliy, who tells us what happened after they were placed in custody. Next week, two more people in the 26 March case, Stanislav Zimovets and Aleksandr Shpakov, will go to trial. Meanwhile, the Bolotnaya Square case continues. Dmitry Buchenkov, an anarchist and political science lecturer from Nizhny Novgorod, is the last defendant in the investigation into disturbances on 6 May 2012, the day of the presidential inauguration. Buchenkov is accused of attacking a police officer that day, but claims that he was not in Moscow at the time. Elsewhere, the Russian authorities continue their campaign against “extremism”. 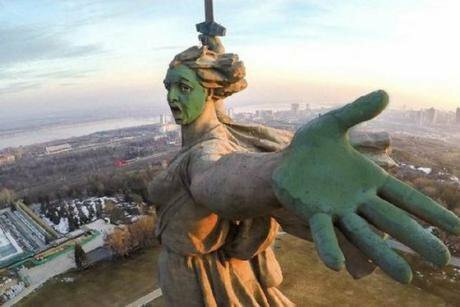 In Volgograd, local authorities have opened a criminal investigation into rehabilitation of Nazism after a collage depicting the city’s Rodina-Mat statue with a green face (in honour of recent attacks against opposition figures) was posted in a social network group in support of Alexei Navalny. An activist from the Vesna (Spring) movement has been accused of spreading propaganda about ISIS for reposting a satirical clip from The Daily Show. Volgograd's Rodina-Mat is given a Photoshop makeover in honour of attacks against Russian opposition figures. Moreover, there’s signs that schoolteachers and police officers are pressuring the children of Jehovah’s Witnesses. District police officers visit these children, or they’re summoned to see the school director (where local police officers are, in fact, waiting instead). Members of the community link this to the fact that the organisation was recently declared extremist, and its activities were banned on Russian territory. After Baptists in Khanti-Mansiisk made a complaint about a local Orthodox priest, he’s now being investigated for extremism. During a Victory Day speech, the priest accused Pentecostalists, Baptists, Jehovah’s Witnesses of impeding Russia’s victory against Germany in World War Two. In annexed Crimea, the regional Prosecutor’s Office is trying to extend Ruslan Zeitullaev’s sentence to 17 years. Zeituallaev was sentenced for being a member of a Hizb ut-Tahrir group, which is banned in the Russian Federation. Originally having received a seven year sentence, Zeitullaev was then sentenced to 12 years following the prosecutor’s appeal. 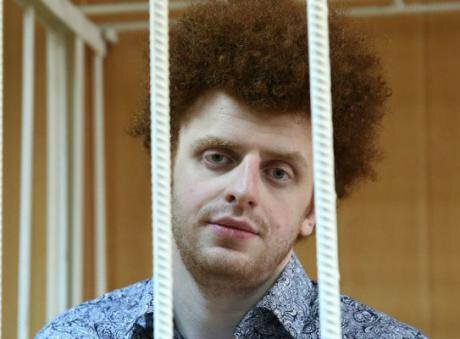 Zeitullaev’s lawyer links this pressure to the fact that “he is not just serving his sentence, he is constantly demanding the release of political prisoners, and is organising protests.” Zeitullaev recently announced he was going on hunger strike. There’s good news, too. Ivan Nepomnyashchikh, who was sentenced as part of the Bolotnaya Square case, and who recently spent 21 days in solitary confinement in Yaroslavl, has been released from solitary. Indeed, the colony chief, Aleksandr Chirva, has been fired. Prior to this, Nepomnyashchikh and other prisoners were brutally beaten by prison officers. Check out the commentary of Irina Biriukova, who represents the prisoners, on this situation here. Next week, court cases start for two people. On 22 May, Dmitry Boinov, an activist involved in defending Moscow’s Dubki park, faces charges of beating up park security guards, and on 25 May, Natalia Sharina, director of Moscow’s Ukrainian Literature Library, goes to trial for allegedly inciting ethnic hatred by distributing books, and also misuse of funds.